Almost five years ago, my journey as a full-time playing card designer started with the original Federal 52 Kickstarter project. During that project, I designed two unique court card sets that spanned across 11 different editions in the series. 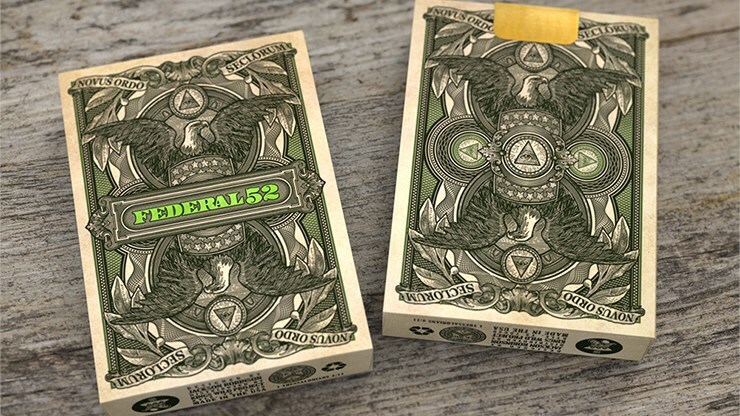 The Federal 52 2nd Edition is a hybrid of both the original Federal 52 court card set and artwork (featured in the Federal 52, Gold Certificate, and Silver Certificate decks), and the artwork of the Reserve Note decks. In this edition, I have taken my favorite artistic elements of the entire Federal 52 series and created an entirely new and unique deck of playing cards. Initial print run of 2500 decks. Printed on Bee Casino Stock (the same as the original Fed 52 series). Cards have an embossed air-cushioned finish. Tuck case has full-color printing, embossing, and hot stamped foiling. On premium matte finished stock.